Want to take your smartphone photos to the next level? The Acesori 5 Piece Smartphone Camera Lens Kit gets you fish eye, wide angle, and macro lenses fit for any smartphone, letting you take DSLR style photos with ease. Normally $50, Jalopnik readers can pick it up today for just $9.99 with free shipping. 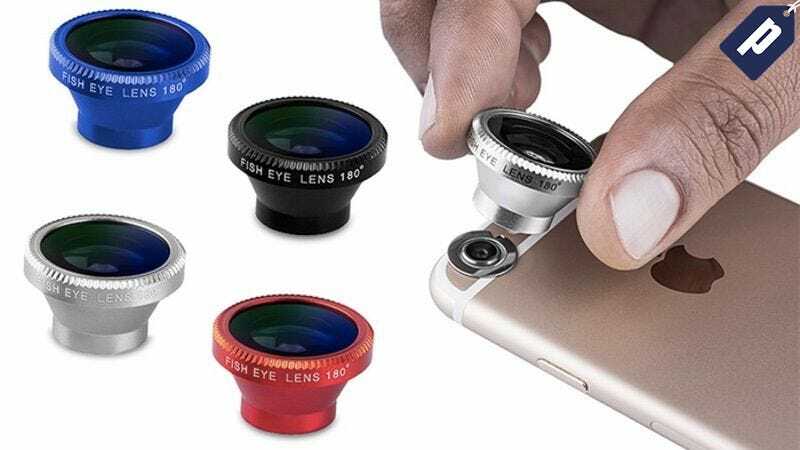 This 3-in-1 lens kit connects to the magnetic ring around your phone’s camera, allowing you to take incredible photos and video through fish eye, wide angle, and macro lenses. The lenses are made from high-quality, anti-scratch glass that reduces glare & reflection and will greatly enhance your photos, and the kit includes metal lanyards and lens covers to keep the lenses protected. This must-have smartphone accessory kit retails for $50, but you can get it today for just $9.99 with free shipping to the US. Interested? Hit the link below to grab yours.